We talk about a lot of things in writing programs (dead grandmas, childhood traumas, broken hearts of every stripe) but we rarely talk about literary success. We rarely discuss the mechanics of publishing a book, how book deals are made and paid, how to market oneself as an emerging writer, or just the business world of publishing in general—which might be why, when one of us hears of the kind of early success met by Téa Obreht or of the early and then continued success met by Gary Shteyngart, we bristle. I’m about two months away from turning 30, and I’d be lying if I said I wasn’t partially disappointed that my first book won’t have come out in my twenties, as it did for both Obreht and Shteyngart, and legions of other writers whose youth is a cause célèbre. On Monday, the Inprint Margarett Root Brown Reading Series welcomed Obreht and Shteyngart, young writers who have earned spots in the New Yorker’s 20 Under 40 list, the National Book Foundation’s 5 Under 35 list, and Granta’s Best Young American Novelists anthology, and I’m happy to report that despite those youth-centered accolades, none of my anxieties surfaced that night. 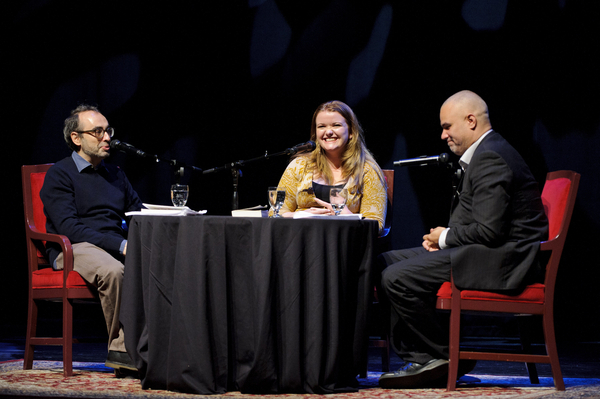 Instead, both writers were charming and humble, and read work that spoke to complex and untold facets of what it means to be a young person in America and the world at large. As moderator Mat Johnson pointed out, each writer deals with the present moment in unexpected ways. Obreht’s novel, The Tiger’s Wife, looks to the past to investigate the variegated present of her Yugoslavian-born heroine, and Shteyngart’s novel, Super Sad True Love Story, looks to a not-too-distant future to allow his second generation Russian Jewish protagonist, Lenny Abramov, to grapple with issues of mortality and love. Shteyngart said during Johnson’s interview that perhaps it was “impossible to write about the present” because the nature of technology and the super-sonic pace of a globalized world makes it so that “the present is gone so fast.”Obreht noted that it seemed difficult to write about her heroine’s present without writing about the ethnically and politically layered past. Shteyngart said during Johnson’s interview that perhaps it was “impossible to write about the present” because the nature of technology and the super-sonic pace of a globalized world makes it so that “the present is gone so fast.”Obreht noted that it seemed difficult to write about her heroine’s present without writing about the ethnically and politically layered past. It occurred to me then that I shouldn’t be discouraged by their youth, but rather proud, proud that these two writers, who were born on either end of my generation, could speak so eloquently about not just the moment, but the moments that came before and would come after. They are living proof that being young in America doesn’t mean you have to ignore the parts—ethnicity, nationality, religion, social pressures, even love—that make you multi-dimensional. More importantly, they prove that being a young writer in America doesn’t mean you don’t have enough experience to say anything. As the reading wrapped up, I was reminded of the first day of a fiction workshop in my MFA program, when my teacher looked around the room at our pensive faces and said something to the effect of: “Relax. Success will come at different times for most of you, but someone will get there first. And then someone will get there second. And so on. Just remember it’s not all going to happen at the same time.” Of course, my teacher was 67 at the time and had a National Book Award to his name, so he wasn’t really concerned about getting there first. But he was right, and if we young writers can learn anything from Monday night’s reading, it might be this: that if we are to write the kind of imaginative and bravely expansive novels Obreht and Shteyngart have written, perhaps it’s a goal worth working hard towards and one worth waiting for. As an aspiring writer, often times I find that I do not have a lot of confidence in the work that I produce. I have so many ideas about subject matters that I can see myself writing about. I often wonder how some authors who write works become literary works of art and others are simply literature but of no real significant impact on the world. It is almost like one has to be in the right moment, creating a piece that will transcend its original creating and hold relevance past that moment. That is the kind of writing that I dream about completing. I am not in my twenties but the dream has been in my heart since I was a child. I find pleasure in putting words together. I find pleasure in creating an instant time and moment for the reader. I find pleasure in delivering an idea, a thought and carrying that persons mind on a journey. It is impressive to me when an author can capture the spirit of an individual. What a smart thought. You’re absolutely right. As a late bloomer (have I bloomed yet? ), I gave up sour grapes long ago. (There are better tasting grapes….) Working hard to write well seems a task for a lifetime—and success, if it follows, is more icing than cake (at least as far as the writing is concerned). Thanks, Aja. When it comes to writing, I have always found myself giving more than required or being too “wordy” as my peers would call it. I’ve always felt that words are so empowering and can speak in volumes yet without vocalization. I beleive that writing is a creative work of art in that it gives the writer the chance to express themselves in ways that one would not be able to voice in front of a group of poeple. In light of the aforementioned, extensive reasearch has proven that public speaking is one of man’sbiggest fears surpassing death itself, wow! This unfortunate matter shows that many people are yearning to be heard but oerhaps they are fearful of being heard rather they should resort to writing as a defense mechanism or an altrenative to speaking publicly. I appreciate the work of all writers in that it inspires those, such as Gary and Tea has, to channel your thoughts and fears into words and if done correctly with training, over time you will soon speaking, metaphorically, to the world in volumnes you never thought you could speak at! I have often been asked to share my work. Be it poetry, short stories, or essays, I have found writing a legal treat that ensures a high. That extremity of the academic literary to the both stunning and grotesque of creative writing found within our minds as students may surprise most. With nothing to loose, the ones who research, read, and study with such self-efficacy as to chase and catch the impending “A”, are often the most creative and awe-inspiring. There is something personal to it all. The professor reads and critiques, your peers listen and give constructive criticism and encouragement, and in our symposiums, we are thrilled to share with those like-minded. With all of this comes an environment of courageous ideas expressed in the most inventive of manners. Thank God I’m yet to graduate. Aja Gabel's fiction can be found in New England Review, New Ohio Review, Bat City Review, Southeast Review, and elsewhere. She holds a BA from Wesleyan University, an MFA from the University of Virginia, and is a doctoral candidate in creative writing at the University of Houston.